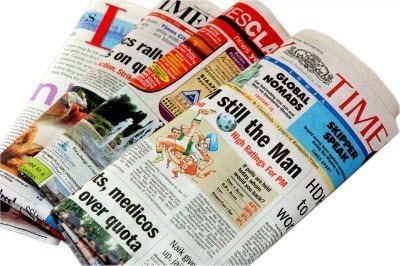 Keeping up with news from around the world through various newspapers can be quite a hassle. There are just tons of different websites, blogs, and RSS feeds out there for so many different types of news outlets. Visiting each one of them on a daily basis can be a nightmare. But that’s when you remember, “Oh yeah, I have a smartphone!”. It’s about time you start using your smartphones and tablets to the fullest. Reading the news and keeping in touch with what’s going on around the world in a simple fashion is one of the main reasons some even own an Android device. Here are some great free news reader apps that help you out with getting the news quickly and easily. First of all, you’ll need an RSS feed reader, an app which will keep you in touch with your favorite news sites and blogs. Feedly is one of the best RSS readers out there, if not THE best, and it has become the reader of choice for many users after the demise of Google Reader (it also has a web version). The app itself is very well-built and easy to use. Once installed, you can just use Add Content – do so via the menu which comes up when sliding your finger left to right – and search for what you want. 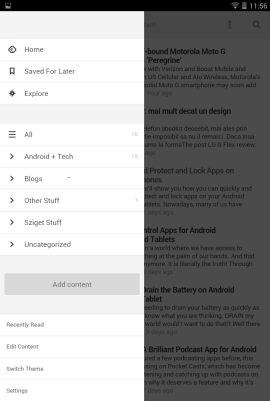 That same menu includes your categories, as well as the ability to take a look at articles you’ve saved for later. After you’ve added your news sources, you can read articles coming from them. Feedly’s interface looks great and the good thing is that websites are opened inside the app, without the hassle of starting a browser and then returning. Another great thing is that you can share any article to social networks, and even save it to services like Pocket, for further reading. 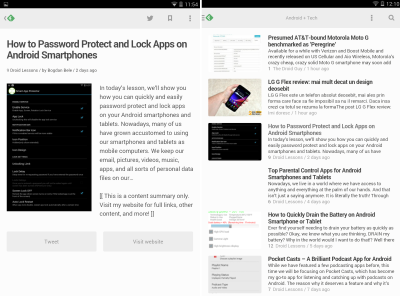 You can get Feedly in the Google Play Store, here. We’ve talked about an app which helps you read news from sources you’re already familiar with, but what if you just want to find out what the most important news of the day is (as well as some of the best articles)? And what if that news can be curated and sorted by category, so you can just get informed, at a glance? 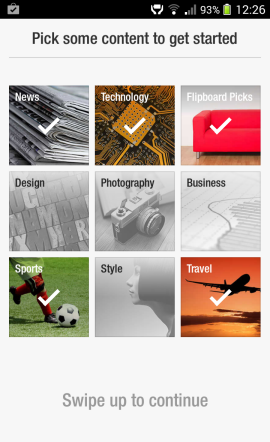 That’s where Flipboard, a free and beautiful app, comes in. You start by picking the topics that interest you, then you tap Build your Flipboard. 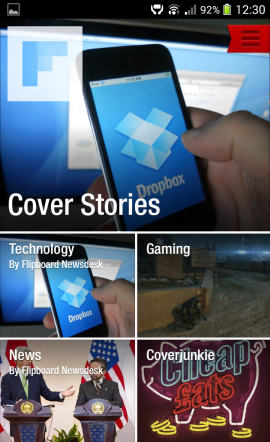 After you Flipboard is prepared, you can start browsing articles (or flipping, if you like that term more). Depending on the device you’re on, you can “turn the page” by swiping your finger up (smartphone) or right to left (tablet). The experience is similar to reading a magazine, albeit a personalized one. 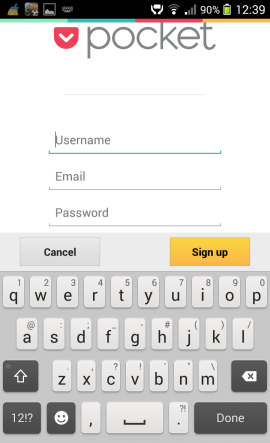 You can then create an account and you can also add your own news sources to the app. It’s even possible to add your Facebook and Twitter accounts, so you can get updates from them inside Flipboard. If you create an account (or login with Facebook), you can have the same Flipboard experience on all of your devices. 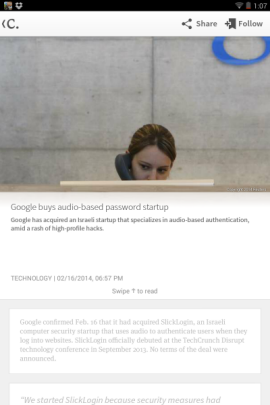 You can download Flipboard from the Google Play Store, here. 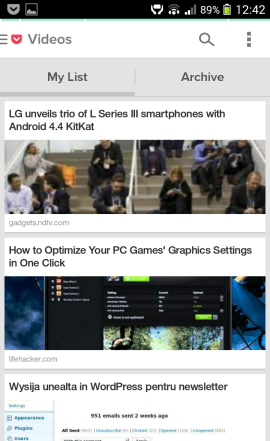 I find Pocket to be one of the most useful tools for a news addict like me. Pocket is a service which allows you to save articles from a browser or from various other apps, like Feedly or Flipboard, for further reading. Start by installing Pocket from the Google Play Store and then create a Pocket account. 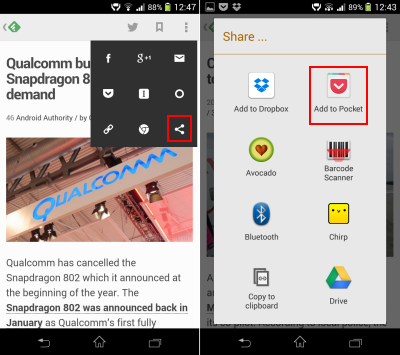 Once you’ve done that, Pocket will make its way to your Android share menu. From then on, whenever you come across something you’ll want to read later, tap the Share button and then Add to Pocket. 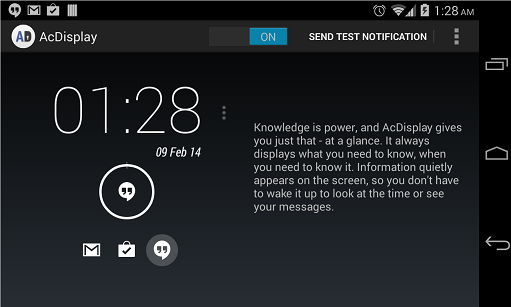 You’ll be able to find it in your Pocket, be it in the Android app or on the Pocket website. If you like the idea of important news selected for you, but you don’t have the time to read the full articles you can find with Flipboard or Feedly, Circa may just be the app you need. Namely, Circa is an app that’s custom-made for mobile news consumption and it aims to provide its users with what’s truly important in the main news stories of the day. Circa’s editors rewrite the most important news in a way that’s easy to read on the go, but you also get a list of quoted articles, should you want to find out more. 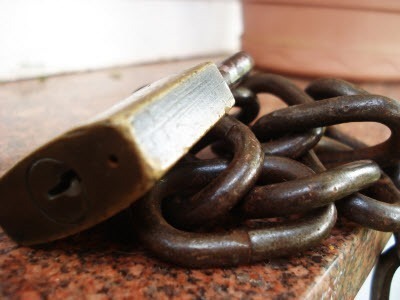 Circa is not for everyone, as some people might find its Spartan style annoying. On the other hand, it can be a good place to find out the important things currently happening, by reading small bits of information about those things. 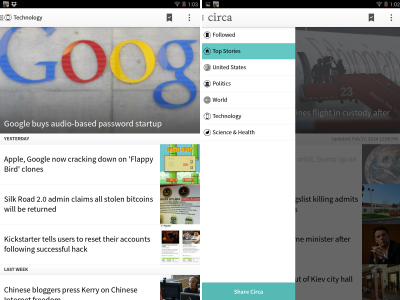 Circa is free in the Google Play Store, here. 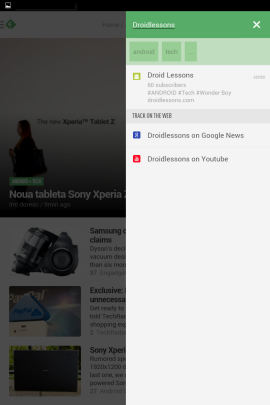 These are just a few useful Android news apps and by no means a comprehensive list. There are new apps that come out every day with similar features. If you use another app that you think is great, please let everyone know by leaving a comment below!